Since my last visit to Rogers Refuge was not successful, at least in terms of turning up rails or a bittern, I was back there again yesterday evening to try again. Instead of walking around, I stood on the observation deck the entire time to make sure I would not miss any of the secretive marsh birds if they did make an appearance. As it turned out, I was waiting a long time. While I was waiting, there were plenty of other birds to watch, so the time did not seem to drag. Red-winged Blackbirds were the most prominent, and their antics kept grabbing my attention. Several times I saw a male glide towards the platform with its red epaulettes fully flared. The males kept chasing each other around and called repeatedly from the reeds in front of the platform, like the bird above. Plenty of other birds were active in the marsh, too. A pair of Wood Ducks was feeding among the lilypads, and occasionally I would see one or two Wood Ducks fly past. Baltimore Orioles were singing in the woods across the marsh, and an Orchard Oriole occasionally sang in the trees behind me. At one point, a feather drifted down in front of me; the lower part was white and the tip was bright orange, about the right size and color for a Baltimore Oriole. Wood Thrushes were singing in the woods; I could not hear their song clearly over the din made by the Red-winged Blackbirds, but the pattern of flute-like sounds was still distinctive. My first Solitary Sandpiper of the season flew in and started walking around the far edge of the water. Finally, around 7 pm, the Sora finally made an appearance. My mother spotted it first when it appeared about ten feet from the left side of the platform, near where a Swamp Sparrow had just landed. It walked around there first and then disappeared into the reeds. Shortly after that it appeared at the water's edge, again within about ten feet of the platform. It was hard to get a clear view, but it was possible to watch it as it moved slowly in and out of the reeds. The reeds and the Sora's movements made it difficult to focus the camera on it, but I did get the image above after a few tries. Longtime readers of this blog might remember that this is not the first Sora I have seen. 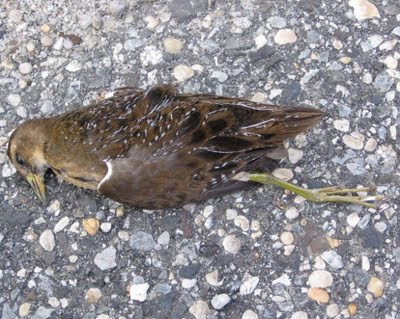 My first Sora sighting was a roadkilled bird that I found one morning on Sunset Boulevard in Cape May Point. That encounter gave me a much clearer view of the Sora's plumage, but it was far more exciting to see a living Sora!